Powers/Abilities: The Highwayman was an exceptionally skillful biker. His modified motorbike, which he called his Hellfire Machine, was armed with powerful twin laser beams mounted in the headlights (powerful enough to cut an eighteen wheeler lorry in half lengthwise in seconds). It was faster than a normal bike, and capable of making gigantic jumps, virtually from a standstill. The studs of his leather jacket could be detached and thrown, to explode like miniature grenades. His monocle can fire electrical stun blasts. He also used a length of chain as a deadly weapon in hand-to-hand combat. History: (Super Spider-Man and Captain Britain Weekly#231/2 (fb) ) - The Highwayman was a motorcycle gang member. One day a brawl he was in was witnessed by Basil Crushstone, a.k.a. the Manipulator, deposed ruler of the African nation of Umbazi. The former despot was impressed by the Highwayman's combat prowess, and outfitted the thug with a number of high tech weapons, including an armed and supercharged motorbike. Promised great rewards for his services, the newly made supervillain vowed to help his benefactor regain his throne. (Captain Britain I#37/1) - The Highwayman was racing down a lonely country road. Spotting an oncoming lorry, instead of simply passing it on his own side of the road, the sinister cyclist deliberately raced directly at it, then at the last second activated his twin headlight lasers, slicing the vehicle in half straight down the middle. Without slowing he hurtled laughing through the gap as the two halves of the ruined vehicle crashed on opposite sides of the road. Moments later, a car carrying Jacko Tanner and Brian Braddock came across the carnage, and spotted the guilty party just ahead of them. Reasoning that with no police around, it was up to them to stop the villain, Jacko Tanner gave chase. The Highwayman soon spotted his pursuers, and allowed them to come alongside him. But when Jacko demanded he pull over to answer some questions, the Highwayman pulled a stud off his leather jacket and threw it at their car's tires. The stud exploded, and the car crashed off the road. With his latest victims hanging unconscious amidst the wreckage, the Highwayman rode on. (Captain Britain I#38/1) - The Highwayman gloated about his recent encounters, but then realized that he had business to attend to, and a meeting to keep with the Manipulator. His ride was soon interrupted when the superhero Captain Britain landed in his path. Unimpressed, the Highwayman raced at his opponent and blasted him with his headlight lasers, but the beams dissipated against Captain Britain's force field. Then the hero used his sceptre to knock his murderous foe off his bike, and began to hammer away at him relentlessly. However the hero was weakened by recent injuries, and the Highwayman rallied. He kicked the hero across the face, knocking him through the crash barrier at the side of the road and into a ditch. 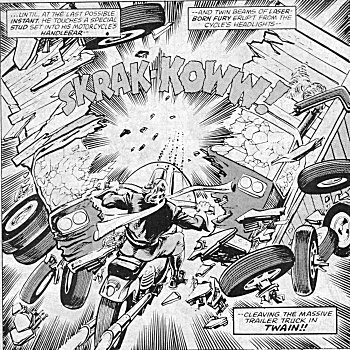 Pursuing his stunned enemy, the Highwayman through three of his stud bombs; Captain Britain narrowly managed to activate his forcefield in time to survive the resulting explosions. The Highwayman followed up by hitting the hero with a stun blast from his monocle, then struck him with a length of chain. The hero tried to fly away long enough to give his head time to clear, but the Highwayman's chain yanked Captain Britain's sceptre out of his hands, and without it to keep him aloft, the champion crashed down to earth and into a tree. Captain Britain lay unconscious at the Highwayman's feet as the villain gloated and decided to deliver his helpless opponent to his boss. (Captain Britain I#38/1 - BTS) - The Highwayman was as good as his word, and handed his adversary over to the Manipulator. (Captain Britain I#38/1) - With Captain Britain restrained in a high tech device of the Manipulator's, the Highwayman discussed things with his employer, asking him if having the hero in his custody altered the Manipulator's plan. The master criminal replied to his crony that it did, and explained that he would brainwash the hero to attack the Queen. (Captain Britain I#39/1) - When Captain Britain attacked the Queen at a public rally, the Highwayman rode in to defend her. He knocked the mind-controlled hero off the podium with his chain, and when Captain Britain responded by throwing a large plank of wood at him, the Highwayman blasted it out the air with his lasers. The hero retreated, with the Highwayman in hot pursuit. The overconfident villain was knocked off his bike however when Captain Britain uprooted a tent pole and used it as a club. Then the hero leapt on the biker, only to fall fowl of his monocle's stun-ray. With the battle over, the Highwayman stood over his fallen opponent. Chief Inspector Dai Thomas, who had been policing the rally, thanked him for saving the Queen, but warned him against taking the law into his own hands again. Then Queen Elizabeth thanked the Highwayman personally, and her "saviour" asked if he could be allowed a look inside Buckingham Palace as a reward. The next day, while being shown round Buck House, the Highwayman skillfully purloined the Queen's favorite diamond ring and substituted an imitation containing the Manipulator's mind-control gem. Later that day he accompanied the royal party when they went to Portsmouth to watch the fleet pass, and was present when his employer took control of not only the monarch, but also the entire Royal Navy. (Supder Spider-Man & Captain Britain Weekly#231/2) - The Highwayman stood alongside the Queen onboard the Royal Yacht Britannia as she commanded the fleet to follow her to Africa. A few minutes later, once things were underway, the Highwayman kissed Queen Elizabeth on the hand, and slipped the Manipulator's ring off her hand. Then he mounted his bike, and jumped it from the deck of the Royal Yacht onto the flight deck of the aircraft carrier the Ark Royal. He spotted Dai Thomas of Scotland Yard, who had smuggled himself on board, knocked the policeman unconscious, and delivered him to his boss. He stood by the Manipulator as the former despot explained his plans to his new captive, before announcing that they would next drop the tied-up Dai into the English Channel to drown. Captain Britain, who had also snuck onboard and had been listening from the other side of the bulkhead, swung the hatch open at this. The hero knocked down the Highwayman with his star sceptre, but was laid low when the Manipulator fired a deadly gas into his face. As superhero and policeman began to choke to death, both villains walked out the room, the Highwayman protesting the hero had merely caught him off-guard. (Supder Spider-Man & Captain Britain Weekly#232/2) - The Highwayman stood on the flight deck of the Ark Royal alongside his gloating employer. An explosion below decks, heralded the survival and escape of Captain Britain, who flew out from below decks with Dai Thomas in tow. The Highwayman offered to beat the hero up with his chain once more, but the Manipulator told him to let the mind-controlled seamen of the British navy do the job. However Dai Thomas stopped the beating when he set off some signal flares which broke the Manipulator's hypnotic spell. 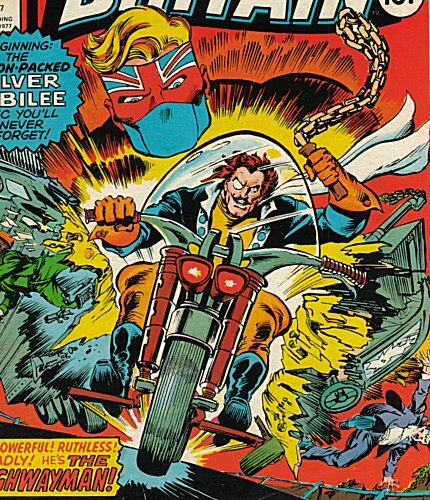 The Highwayman fired his bike laser at the ship's superstructure, causing it to crash down, narrowly missing Captain Britain, then the biker started to race around him, striking him from all sides with his chain. The hero took the beating as best he could, then hurled his sceptre into the motorbike's spokes, causing the Highwayman to skid out of control and smash his vehicle to pieces against the side of the ship. After the defeat of his boss a few minutes later, the stunned Highwayman was taken into custody. 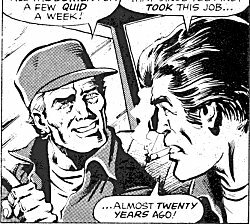 The Highwayman marks a truly awful attempt by an American writer of Captain Britain to mimic a British accent. The first fight between Captain Britain and the Highwayman is said to have happened on the M20. This is motorway (major freeway) which runs from London to Folkestone in Kent, and which passes near the English end of the Channel Tunnel. Highwayman's real name was revealed in Marvel Atlas#1. Two truckers unlucky enough to cross the Highwayman's path when he was in the mood for mayhem. He sliced their vehicle in half, in all likelihood killing them both. Alf had been driving lorries for nearly twenty years prior to this.